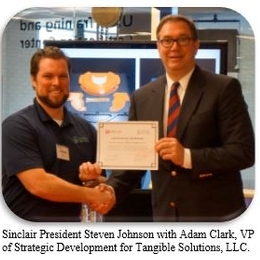 Sinclair College announced a new partnership with Tangible Solutions on Tuesday, February 24, 2015 that explores research and development opportunities in the field of 3D printing, also known as additive manufacturing. The partnership will address the need for innovative manufacturing processes designed to advance the development of unmanned aerial systems (UAS). The collaboration will expand Sinclair's ability to reach a broader market for UAS programs by incorporating expanded additive manufacturing content while boosting Tangible Solutions' access to a trained workforce and offering an outlet to facilitate training opportunities. "We are proud to be at the cutting-edge of 3D printing education and training by building upon Sinclair's proud traditions of innovation and community alignment with the region's manufacturing heritage and future," said President Steven Johnson. As a result of the partnership, Sinclair and Tangible Solutions will be able to share subject-matter expertise in the realm of UAS and 3D printing to build course curriculum for future classes. Initial breakfast briefings and short courses are being scheduled to occur at Sinclair's Dayton campus to provide an orientation to 3D printing, including demonstrations of the technology and how it can be applied to existing and emerging manufacturing challenges.